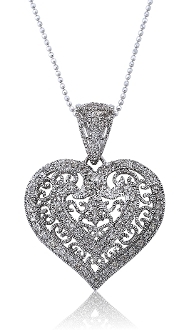 This exquisite art-deco inspired filigree heart pendant shimmers immaculately from all angles beautifully fashioned in pure 14 Karat White Gold, this unique Diamond filled heart pendant features intricate detailing, and an open scrollwork pattern throughout the Heart. The 0.30 Carat t.w. brilliant round cut Diamonds are bead-set along the border of the heart; to showcase the ornate milgrain scrolling throughout the middle, with even more brilliant round bead-set natural Diamonds in the form of a second heart in the middle. The detail and craftsmanship that has gone into this pendant is pure romance. Buffed to a brilliant shine, this locket suspends from a 16 inch Diamond cut ball chain that flows through the V shaped Diamond accented filigree bail, and secures with a spring ring clasp. Perfect for day or night, and the perfect complement to any outfit, this gift is sure to wow the one it is given to.